Description: Work in progress. One of a set of two modules with mirrored track layout. The track layout allows switching from the front track to one of the diverging tracks, thanks to a Tomix N-PL-280 turnout. The radius is not a 100% match (280 mm vs 282 for Kato's tracks), but close enough that the resulting gaps don't matter. The whole module is built to double width; geometrically it's equivalent to a Jackson Junction plus 23 mm added at the left end. That allows creating some layouts without the use of 23mm long filler modules, but makes them required for other ones. Either way, some Kato track was required between the Tomix turnout and the end, and this seemed like the easiest solution. For stability, the 23 mm filler piece at the left end is soldered to the turnout. 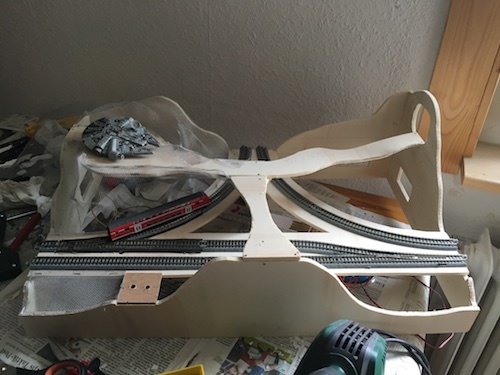 No transition track was used between the track systems; Kato and Tomix tracks connect nicely if you just cut off the plastic "noses" on the Tomix track (and use normal rail joiners). All three lines are electrically insulated from each other and feature power drops. The turnouts will eventually be controlled by a DCC decoder, which will also feature buttons to control the switches directly.